"Most honest combat vets will tell you, perhaps not eloquently but in their own way, the same thing: essentially that combat is in our human DNA and demands to be exercised... The question is, can we humans evolve peacefully, or will we succumb to instincts we can’t transcend?" These findings came about over an eight-year period through the Atrium Society’s Liberian Peace Education Project into the causes of its 15 year-civil war for and the effect this had on former Liberian youth combatants. It revealed at first that these young combatants had been psychologically conditioned to fight people they were told were their enemies because of years of political and economic propaganda. But later as the project progressed it was then discovered that there was a far deeper biologically primitive impulse inbuilt into their brains that was the root cause of conflict, indicating that the biological brain was the source. It was this primal instinct for survival that consequently created the divisive cultural ideological prejudicial conditioning. Thus recognizing this as such, it was important to create resources and training programs that addressed both the primitive biological and psychological brain to get to the root cause and the symptom simultaneously. This significant perception has been integrated into the programs of the Atrium Society since it’s intent is to prevent prejudicial conflict from happening at the source – from the "playground to the battlefield." From this initial discovery with Liberian children of war it was then ascertained from further investigation that in general this biological instinctual drive has understandably been rooted for eons in the primitive human brain of all human beings being hardwired for war as a genetically programmed survival instinct – that "combat is in our DNA and demands to be exercised". But it is erroneous for it is programmed to only insure survival for the individual segregated ethnocentric group and hence it is therefore preventing survival for the whole within which the individual group is an integral apart of and thus it is destructive for all. It was determined then that the extreme outcome of this genetically erroneous hardwired compulsion for racial self-protection, due to the genetically driven divisively destructive nature of ethnocentric superiority, could be called "genetic genocide." See: Causes of War. The Atrium Society, a nonprofit, nonsectarian, nonpolitical organization, was founded in 1984 by Jean Webster-Doyle, Peace Educator, in Ojai, California, USA. The intent of the Atrium Society is to provide education and materials about the divisive nature of psychological conditioned thinking that is at the root of individual, social, and global conflict. In 1984, Dr. Webster-Doyle became Director of the Atrium Society. With Dr. Webster-Doyle’s educational direction the Atrium Society ran a pilot middle/high school from 1985-1989 in Ojai, California to investigate ways to implement curricula on psychological conditioning to educate young people about the roots of conflict. From 1990 until present the Atrium Society has devoted its energies to creating and promoting the Education for Peace Program that is designed and written by Dr. Terrence Webster-Doyle. The Education for Peace program liberates young people from the conditioned, divisive thinking at the root of bullying, racism, and war. Dr Webster- Doyle also designed the innovative Martial Arts for Peace program to bring forth a martial art that helped young people to learn the skills to avoid, resolve and manage conflict intelligently. The Martial Arts for Peace program includes a special focus on developing mental and physical confidence so that children do not react in a fight or flight manner to bullying. In 1991 The Atrium Society organized the Children’s Disarmament Day in Middlebury and Burlington Vermont. Over a thousand people attended and the Governor of Vermont, then Dr. Howard Dean established a peace education day due to this event. From 1991-1996 the Atrium Society presented its work at three International peace conferences in Paris, Montreal, and in Vermont. The Atrium Society has published over 70 youth peace literacy works written by Dr. Webster-Doyle. 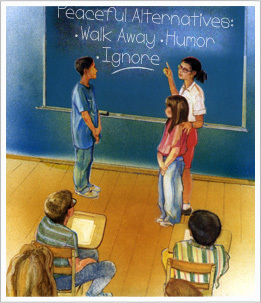 The Education for Peace books have won praise from educators, counselors, parents and others who work or live with young people as practical tools for helping children deal with bullying, racism and to understand the psychological roots of conflict and violence. The Atrium Society, through its International Youth Peace Literacy Project, has donated thousands of books to children in disadvantaged areas in the USA and globally to help them gain the skills to deal with conflict peacefully. Dr. Webster-Doyle and Mrs. Webster-Doyle have traveled throughout the USA and Canada and have also visited Europe, Russia, Mexico and the Caribbean to give seminars and train teachers. In 2002 The Atrium Society started a special project to work with Youth At Risk Centers in Canada and the USA. The Atrium Society in 2004 has helped to initiate programs in Australia, England, and Iran. In 2004 the Atrium Society certified Mr. Marvin Davis of Liberia as trained in Youth Peace Literacy for West Africa to represent and teach the programs there. The Atrium Society’s Education for Peace books have received many awards and acclaims. The Atrium Society today is an internationally known Peace Education organization whose work is archived in perpetuity at the University of Connecticut's Northeast Children's Literature Collection, Swarthmore College Peace Collection and the University of Southern Mississippi's de Grummond Children's Literature Collection in the USA. The work is also on permanent display in the International Museum of Peace and Solidarity in Samarkind, Uzbekistan, the Commonwealth of Independent States, at the Hiroshima Peace Memorial Museum, Hiroshima Japan and at the Samara State Academy of Culture and Arts, Samara Russia. The work is also archived in perpetuity at No Gun Ri International Peace Foundation, South Korea."